LINDEN, New Jersey (WABC) -- A Linden mother, missing for months, has been found dead and now two people are under arrest. 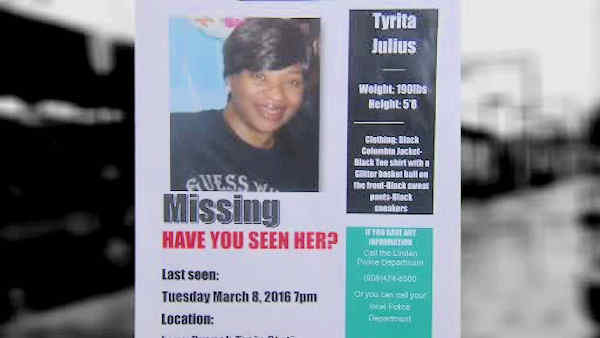 Tyrita Julius was last seen March 8 after having lunch with a friend. The friend told police Julius was dropped off at the Long Branch train station so she could return to Linden, where she lives. Julius was undergoing physical therapy after she was shot several times in her torso and pelvic area while entering her car in Linden with her 15-year-old daughter in November 2015. The daughter sustained graze wounds. The gunman fled in that case. Authorities say it's possible the shooting and the woman's disappearance are connected. Now 33-year-old Jennifer Sweeney of Tinton and 32-year-old Andre Falls of Long Branch are under arrest. The charges against them include first degree murder, desecration of human remains, and tampering with physical evidence. Bail is set at $1.5 million in cash only. The medical examiner will determine the 42-year-old's exact cause of death. So far, prosecutors are not giving details on where Julius' body was found or what led to their arrests.